Are you up for the challenge of walking 10000 steps a day? Good, then let's get started. With the right tools and approach anyone can do it including you. How many steps a day are recommended daily? According the Ministry of Health Labour and Welfare of Japan and the Japan Promotion & Fitness Foundation getting around 10000 Steps a Day is a definite must for staying healthy. To be exact, 8500 Steps for Men and 8000 Steps for Womenare recommended daily. How you get those 10,000 steps a day is another matter open for discussion. Before you try to take on the 10,000 steps per day recommendation for losing weight, it may help to know how many miles are in 10,000 steps before hand. Walking 10000 steps for weight loss isn't easier but with the right perspective you'll be on to walk 10000 steps a day in no time. In this walking exercise Slism, we introduce the 10000 steps a day walking challenge to tone your legs and serve as a bottom line in your fitness routine. Finding the time to meet the requirements of the proceedings of Healthy Japan 21 that states you must walk 1000 steps a day, on your pedometer can be difficult not to lose track. Most of the time it isn't just that you accidently reset you pedometer but the fact you don't have one. That is why for people without pedometers, knowing "how many miles 10000 steps is," is the preferred approach. If you are walking 10000 steps a day, roughly speaking that is going to be 4-5 miles a day. Note that to estimate this distance, a walking gait of 70cm and a pace of 220ft/min were used. At the given walking pace it, this can be done in 104 minutes, which if you are motivated can be done in 1 hour and 30 minutes. In the reality of the situation you are probably not going to have the time to get all you 10000 steps in a single stretch. That's okay. The bottom line is that as long as you get your steps in from the time you wake up till the time before going to sleep, it all adds up in the end. Will Taking The Train in Tokyo Help You Get All Your Steps In? Train station in Japan especially in the area surrounding the metropolis of Tokyo, train stations are said to be positioned as much as 1-2 miles apart. Even in short trips along a route known as the Yamanote-Line that goes just about anywhere, the next station is on average half a mile away. Trying to walk from one station to another preferably on your way back from work (as you are eager to make it to work on time) is one way to get you miles in each day. However, walking through the busy streets and residences may be more distance to cover than expected. The best tip to making skipping a train stop in Japan for exercise is to time yourself. More importantly, getting a firm grasp of how close you are to achieving the bottom line in casual walking is key. To do this you need to know one of the following: time spent walking, distance walked, or amount of exercise equivalent to walking. Here is a short list of ways you can get even more steps throughout the day. Wearing a pedometer may seem like something you would not want to forget alongside a fanny-pack but if you haven't been keeping up with the latest in pedometer technology you would be surprised what convenience is offered by the newest smart pedometers available today. The latest smart pedometers are not only slick but can be attached just about anywhere not limited to your belt in a similar fashion that Nike+ products work. With extra functions like integrated calories counting and instant transmission from your smart pedometer to your personal computer or tablet PC, everyone is talking about how great smart pedometers are, given that they don't have the latest smartphone app. Is Taking On The Healthy Japan 21 Challenge Reasonable? For a person weight 110 pounds with a walking gait of 70cm at a pace of 67 meters per minute who walks 8000 steps, 220 calories are burnt off during the day walking. This is said to be the same amount required to lose 1kg of body fat in a month. Although hearing that you can lose 1kg of body fat in a month may seem like a spam at first. It's totally possible given that you watch what you eat avoiding situations that beckon overeating such as eating while drinking alcohol. More important than trying to lose weight in a certain time frame, is developing healthy habits like regular exercise such as walking to help maintain your weight improving upon your lifelong health perspective. How do you spend your spare time? If it’s not productively, consider adding something simple to your daily regimen. Something as simple as going for a short walk is a forgotten concept to most who use their free time on television and online. Go for a walk in the morning to strengthen your heart and mind, lift your mood, and leave you feeling refreshed and ready to take on the day. 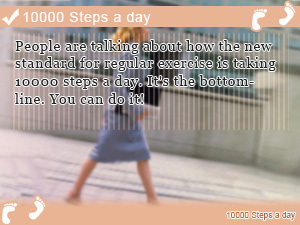 People are talking about how the new standard for regular exercise is taking 10000 steps a day. It's the bottom-line. You can do it! Continuing to walk 10000 steps a day for a month accompanied with a balance diet may help you reduce fat around your body. How about that? Challenge yourself and the rest is history. 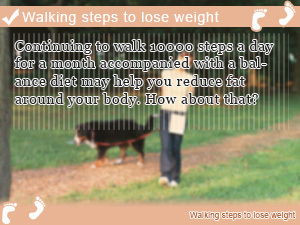 Start taking 10000 steps a day today as you move closer and closer towards your goal in weight loss.